A moving and inspirational true story of survival and triumph against incredible odds, celebrating the importance of never letting go of what drives the human spirit – hope. A true story of survival and triumph against incredible odds, now a major motion picture starring Dev Patel, Nicole Kidman and Rooney Mara. When Saroo Brierley used Google Earth to find his long-lost home town half a world away, he made global headlines. Saroo had become lost on a train in India at the age of five. Not knowing the name of his family or where he was from, he survived for weeks on the streets of Kolkata, before being taken into an orphanage and adopted by a couple in Australia. Despite being happy in his new family, Saroo always wondered about his origins. He spent hours staring at the map of India on his bedroom wall. When he was a young man the advent of Google Earth led him to pore over satellite images of the country for landmarks he recognised. And one day, after years of searching, he miraculously found what he was looking for. Then he set off on a journey to find his mother. 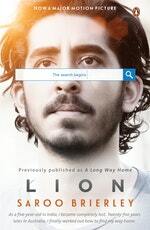 Lion: A Long Way Home is a moving and inspirational true story that celebrates the importance of never letting go of what drives the human spirit – hope. I’ve been thinking about this day for twenty-five years. Growing up half a world away, with a new name and a new family, wondering whether I would ever see my mother and brothers and sister again. And now here I am, standing at a door near the corner of a run-down building in a poor district of a small, dusty town in central India – the place I grew up – and no-one lives there. It’s empty. The last time I stood here I was five years old. Love Lion: A Long Way Home? Subscribe to Read More to find out about similar books.